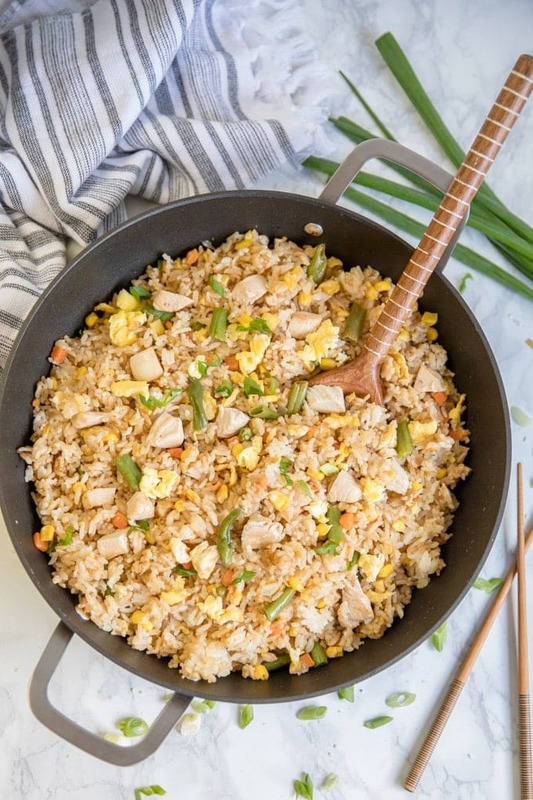 Learn how to make Chicken Fried Rice the easy way with this simple, and so much better than take-out Chicken Fried Rice Recipe. Made with just a few ingredients and packed with flavor, this easy dinner is is a real crowd pleaser. 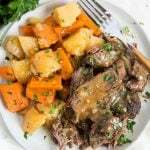 I love this recipe because it’s a complete meal all made in just one pan, and it’s a great way to use up leftovers! It’s one of our favorite Asian inspired, better-that-takeout meals, rivaling favorites like Crockpot Orange Chicken and Beef and Broccoli. I have been making this rice recipe since the first time I watched a Teppanyaki chef cook it in front of me at a local restaurant 20 years ago. Yes, I learned how to make Fried Rice from Benihana. Don’t judge, because it’s seriously the best thing ever. This recipe is a one of my family’s favorites, and I love it because it’s simple and easy to customize simple with ingredients I always have on hand. I make fried rice at least once every few weeks, swapping out the protein with what we have leftover. For the veggies, I tend to mostly use frozen mixed vegetables because they are quick, but if I have an abundance of fresh, carrots, broccoli or zucchini I’ll throw those in as well. Start by cooking some chicken breast filets or tenders. Season both sides with salt and pepper, then cook them in the skillet or bake them in the oven. You can also use leftovers that you have on hand. Let the chicken rest while you continue with the other ingredients. Scramble some eggs in tiny bit of oil or butter. A nonstick deep skillet or Wok is best for this. Remove them from the pan and set aside on a plate or in a bowl. Stir in some frozen mixed veggies ( you can thaw them first, or not). I like to add a little butter at this point to add flavor but it’s not necessary. You could easily swap some fresh veggies for the frozen, but you’ll want to cook/steam them first. 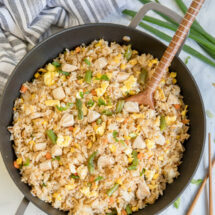 Turn the heat up to medium-high and add cold rice to the skillet and stir it with a flat wood spatula. Stir the rice together with the vegetables, breaking it up a bit as you go. I like to press the mixture into the skillet and let it sit for a bit over the high heat. This will give you some of those crispy pieces of rice that I happen to really love. Once the rice is heated through, dice the chicken into small pieces and add it to the rice with the eggs. Give it a few minutes to heat, then add soy sauce and sesame seeds until you love the flavor. Serve it right away because it’s more delicious when it’s piping hot. I like to garnish with sesame seeds and green onions, but that’s totally optional. 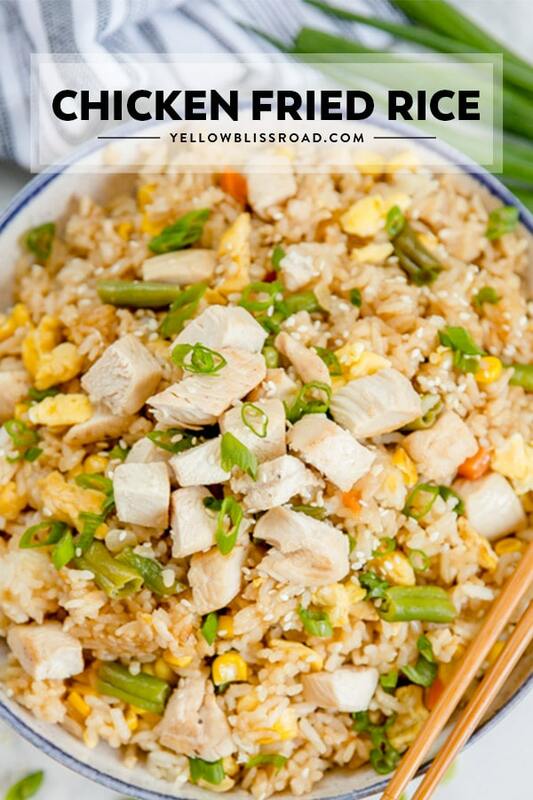 WHAT GOES WELL WITH CHICKEN FRIED RICE? 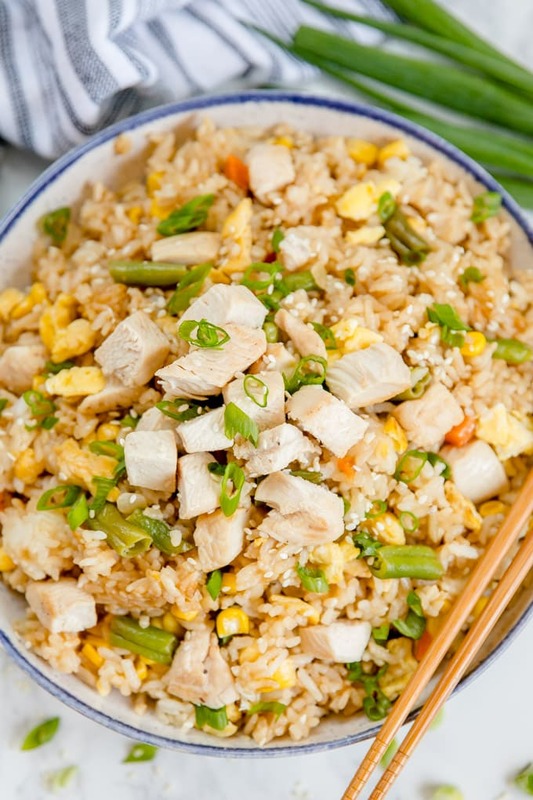 Chicken Fried Rice is a complete meal on it’s own, so it’s not necessary to serve it with a side dish or main course. However, you can make a hearty meal by adding some eggrolls, wonton soup or grilled steak. 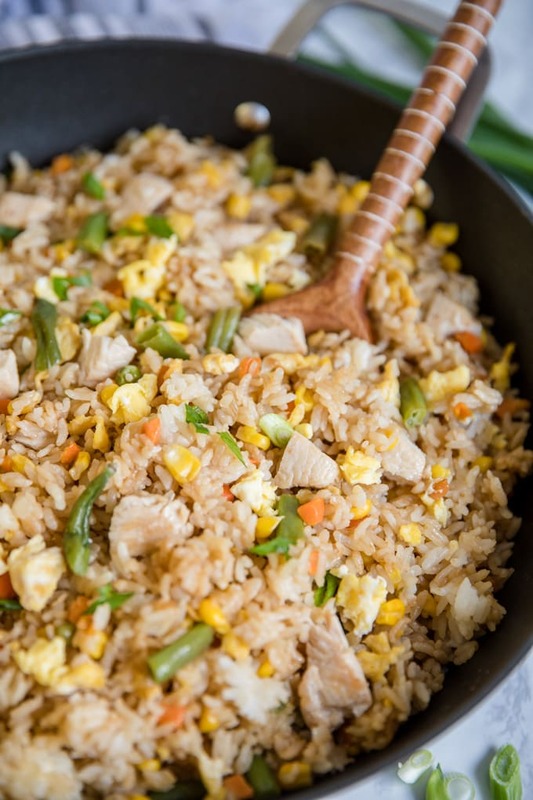 WHAT TYPE OF RICE IS BEST FOR FRIED RICE? I have used all kinds of rice from Botan to Jasmine to a regular long grain rice and all have worked well. Most seem to prefer the fluffier Jasmine rice but my family really loves the stickiness of the Botan. I consider it a personal preference – we eat all types of rice and just use what we happen to have leftovers of. 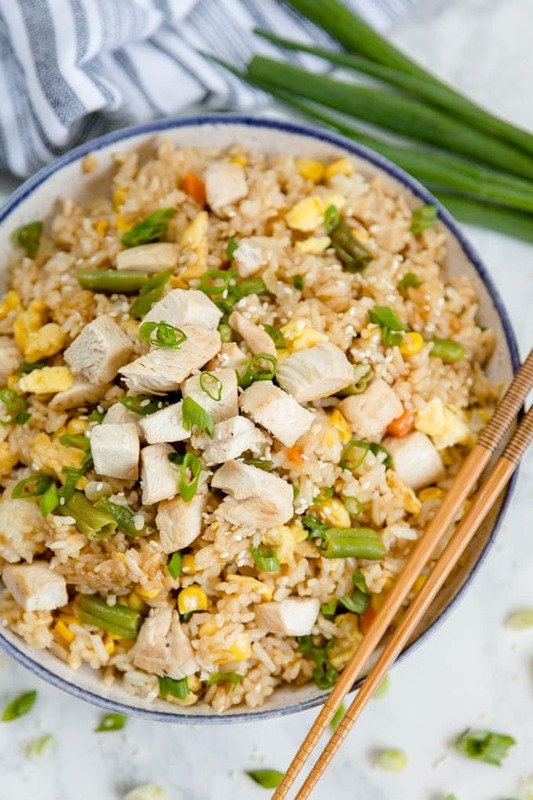 Chicken Fried Rice will last 3-4 days in the fridge if properly stored in an airtight container, and reheated in the microwave or with a bit of oil in a skillet on the stove. In the freezer, it will last about 4-5 months for maximum freshness and should be thawed in the fridge before reheating. I actually love it for breakfast the next day! 1 ½ cups frozen vegetables carrots, peas, corn, etc. Heat a wok or large, deep skillet over medium-high heat and add a teaspoon of olive oil. Whisk in the eggs and cook, stirring often, until set. Transfer to a plate. Add 2 tablespoons of olive oil to the skillet. Season chicken with salt and pepper and place chicken side by side in the skillet. Do not crowd (overlap). Cook chicken until no longer pink; 3-4 minutes per side. Transfer to the plate with the egg. Add onion to the pan and cook until translucent; about 2 minutes, stirring often to avoid burning. Stir in garlic, then add frozen vegetables and cook until heated through. Season with a pinch of salt. Add cold rice to the skillet and stir to combine with the vegetables. Press down into the pan to brown the rice lightly for a couple of minutes, then stir and repeat a few times. Return the chicken and scrambled egg to the skillet and stir to heat through. Remove from heat, then stir in 1-2 tablespoons of soy sauce. Use more or less based on your liking. Garnish with sesame seeds and sliced green onions and serve immediately. Store leftovers in a tightly sealed container for up to 3 days. Microwave to reheat. Feel free to use any vegetables you like, frozen or fresh. If using fresh veggies, be sure to steam them first so they are soft. For a little extra flavor, use butter instead of olive oil.